“The shirt displays a “sun cross” (replacing the letter “O” of “PowerShift”), a well-known and notorious white supremacist symbol adopted by the Ku Klux Klan and other white supremacist hate groups. 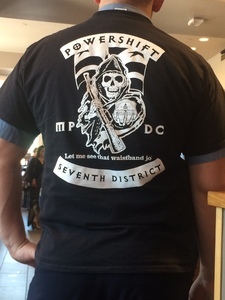 Given the prominent placement of MPD logos and a badge number, the shirt does not appear to be attributed to Officer Altieri alone, but instead, appears to have been designed for a group of officers associated with the MPD Seventh District. Ninety-five percent of the residents in MPD’s Seventh District are black and too many Seventh District residents have experienced harassment and abuse at the hands of the police. This shirt is offensive and indicates systemic bias in the policing of people of color. White supremacy and insinuated threats of death should never be associated with or tolerated in police departments who are sworn to protect and serve. Such ideologies are dangerous and demonstrate a blatant disregard for Black and Brown life. They are at the root of rampant police abuse and result in the unconstitutional terrorizing of Black and Brown communities and the callous murder of Black and Brown men and women at the hands of the police, both in Washington, DC and across the country. You can read the complete petition here. As of 11:30am there were 752 signatories.